Whereas the first four standards address the content, delivery, learning, and development of a classroom, ISTE Standard 5 Digital Citizenship actually deals with the the environment of the classroom. Let us use the example of classroom management. If a classroom has procedures, routines, and engaging lessons, then almost all of your behavior issues will be preemptively handled. Likewise with the ISTE standards, if you met standards 1-4, most of standard 5 will be handled. Standard 5 also provides a framework from which to you can correct errors in implementation. In a way, standard 5 is a checkpoint where a coach can make sure all the bases were covered. Digital citizenship covers the topic of equity. Equity essentially means that everyone has access to the technology. Many teachers will lament that they do not have a 1 to 1 student-device ratio and the reality is they do not need it. Not everyone has a smart phone, but they are very close to being universal. With simply one smart phone in the class and even a makeshift stand, a teacher can record lessons that they made as well as student lessons for the purpose of engagement. With access to one phone they can post these videos to YouTube and rather than lecture, post the video walk around and monitor, and eventually begin to pull small groups for instruction. Using one camera appropriately can be more powerful than 30 laptops. Below is a talk I participated online through Digital IS. Digital citizenship is a new concept for me and I have yet to be able to make large contributions to this area at any of my school sites. Currently I am working on a collaborative website with a partner teacher where we are teaching digital citizenship in a project-based lesson. I have also covered the topic extensively in my classrooms. As my career progresses, I hope to demonstrate and train teachers in embedding digital citizenship into lessons. As I stated, in a perfect world we wouldn’t need Standard 5, but in the event we do, below are resources I created. 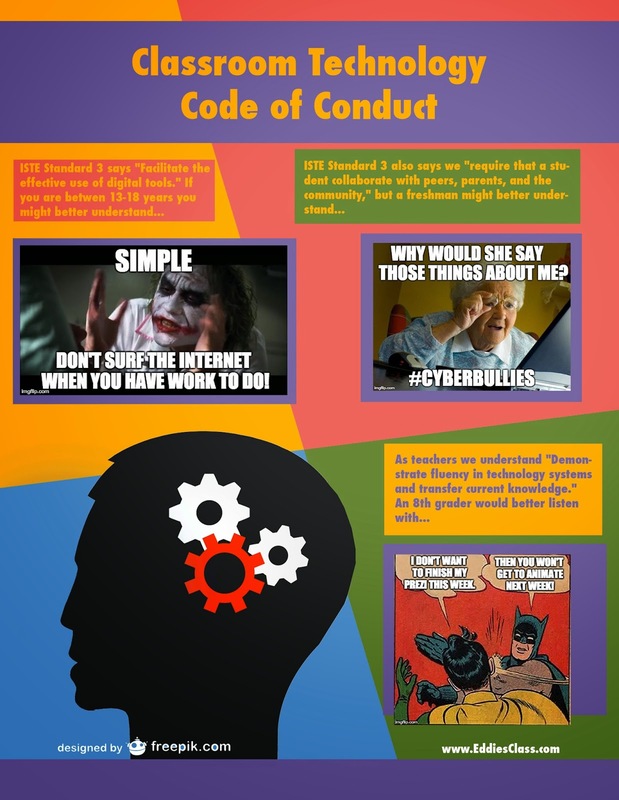 The goal for the poster is for students to understand the meat and potatoes of digital citizenship using ISTE Standard 3. At the high school and middle school level the main issues tend to be misuse of technology, cyber-bullying, and learning software. I attempt to use pop-culture with memes that are commonly found in social media sites such as Instagram and Facebook. The poster is actually a part of my classroom code of conduct and satisfies one of the requirements my district has.